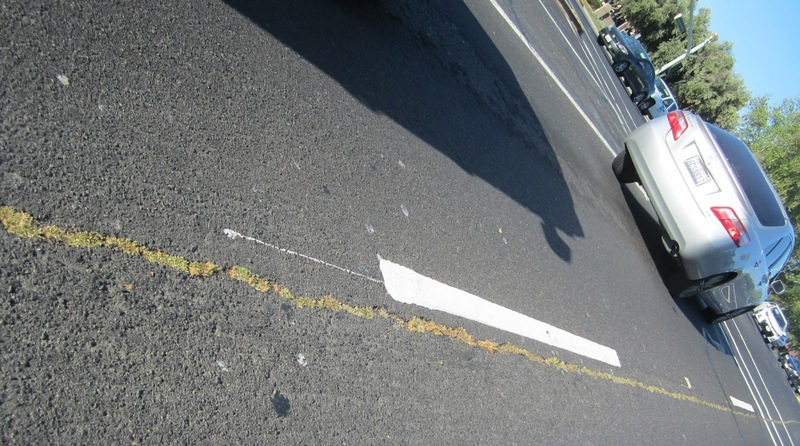 Is Elk Grove Moving Towards Funding Unmet Road Maintenance With a Sales Tax Increase? on Sheldon Road near Highway 99. At Wednesday night's City Council meeting, the possibility of raising Elk Grove sales taxes was discussed twice in budget related presentations by city staff members. The possibility of "engaging voters" in a sales tax increase to fund the city's unfunded $8 million road maintenance deferral came during Elk Grove City Manager Laura Gill's presentation of the fiscal year 2016 budget and Rick Carter's discussion of next year's capital improvement projects. Both staffers made comments suggesting the city's quickly deteriorating roads could be addressed by increasing local sales taxes. of poorly maintained roads in the City of Elk Grove. In her presentation on next year's budget (see video posted below), Gill said the deferred maintenance on the city's roads could be addressed by awaiting funding from a possible 2016 Sacramento Transit Authority ballot initiative. Should that measure not appear on the 2016 ballot, or if it fails, Gill suggested the city explore alternate funding. "We will be discussing alternate financing options to include possible STA (Sacramento Transit Authority) funding, or if it doesn't go through, what option we have to engage voters helping us meet that gap," Gill told council members. Gill noted in an email response to an inquiry of the possibility of seeking a sales tax increase was included in a staff report for the April 9, 2014 city council meeting. That staff report said "In light of the STA decision to not pursue a county-wide sales tax measure on the November 2014 election ballot, City Council may want to consider placing an Elk Grove-specific sales tax measure on that ballot. A ½-cent sales tax increase would generate an estimated $10 million annually." Gill defended the maintenance deferrals noting city road maintenance meets accepted practices and that most are rated in as "good." "That report indicated that the City faces a shortfall of $8 million annually in keeping City roads within an industry standard of good or better," Gill said. Also discussing the possible sales tax increase was city staffer Rick Carter during his Wednesday night presentation on next fiscal year's capital improvement projects (CIP). Like Gill, Carter reminded council members that the matter has been previously brought before, and they deferred a decision on how to finance road maintenance. "This is not a new issue, it have been included in the CIP before," Carter said. "As discussed before, the STA is discussing a half-cent sales tax in 2016." He went on to say that if the STA puts the measure on the ballot and it passes, Elk Grove could receive about $6 million annually that could be used for road maintenance. Carter also said the city council was looking at bonds or a local sales taxes should that funding source not develop. "There has been some discussion of bonds, sales tax measures, and the direction has been to wait and see what happens," Carter said. "We are hoping to have some information in the next couple months if they [the STA] wants to pursue a vote in 2016 or not." In 2013, Elk Grove Public Works Director Richard Shepard issued a clarion call in a lengthy presentation (see video of his presentation here) to the city council warning them of the almost exponential costs escalation that taxpayers would incur if the city continues to defer road maintenance. At that meeting, the city council decided to wait for a possible 2014 STA ballot measure that ultimately did not materialize. For Elk Grove City Council Members Steve Detrick, Darren Suen and Mayor Gary Davis, putting a sales tax increase in front of voters on the 2016 ballot, on which all three will likely appear, could be problematic. Given the pernicious spending on several incomplete discretionary projects, like the purchase of land for a professional soccer stadium, each councilman could easily be painted as irresponsible stewards of taxpayers money by electoral opponents. None of the five council members responded to requests seeking comment on the placement of a possible sales tax increase on Elk Grove's 2016 ballot. They haven't yet demonstrated that they are good stewards of our money--just look at how they've diverted road funds to other uses and the mounds of feasibility studies piled up on the bookshelves! The pro-growth Ponzi scheme to collect developer fees tomorrow (which have been drastically reduced by the way) to pay for yesterday's impacts is a busted model of how to manage public finances. Stop buying property and sell that godd**mn 100-acre rural hay field and put and end to your soccer fetish. Don't try to entice us to vote for the sales tax by throwing in goodies such as new trails. You should have been doing that all along, along with keeping up on the road maintenance. Why should we have to pay for your mis-management of the public finances? You can only go to the well so many times in this apathetic city--but once you awaken the sleeping giants, your terms will be up. In the words of Clint Eastwood-are you feeling lucky? Go ahead, make my day! I don't believe our city leaders have done enough to make certain the city is living within its means or that they are good stewards of taxpayers monies. When you're exploring any kind of tax, it needs to be a last resort...I don't believe we're in that place. They knew we had a road problem a few years ago and have done nothing to fix that. Just spend monies.... and some borrowed, on their feel-good Feasibility Studies. Yea, I agree, sell that 100 acre hay field. Still want soccer? Well join hands with KJ and toss the ball around with him. We're sick of hearing about it! I really feel aggravated about how our city leaders have squandered taxpayer money, and this puts into a no-win position. I am the type of taxpayer who always supports infrastructure maintenance and expansion. It is of utmost importance to our city and society. Given that position on my part, I would nearly always vote to support infrastructure with a small increase in my taxes, which I consider my obligation as a member of the city. HOWEVER, I do not trust our city leaders to use our money wisely and put infrastructure at a priority in an ongoing budget. I am not going to vote or support further tax/fee increases with our current leaders. They have proven they are not to be trusted with our money. I feel angry about this, because I do support infrastructure expenditures. What about the water park and soccer stadium? How much was pissed down the drain? All of the above, my thoughts exactly. The really sad part though, is that they don't really care what we think or want and certainly wouldn't want any feedback from the community. I will not support sale tax increase, simply because our current city leaders have repeatedly proven themselves that they are untrustworthy, I am not trusting them with our tax dollars or our safety. They have led us into THE DEEP PIT in all aspects of their leaderships. They have repeatedly chosen to serve their best interests over our needs. It is our fault that we have been expecting too much from these INDISCRIMINATE LIP TO TAIL FEEDERS and are now asked to pay what are due.